Are you ready? 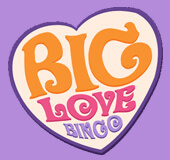 As Big Love Bingo, the cheesiest new bingo site in town has landed to spread some big love for 2016! Hosted by the smoother-than-smooth Barry Big Love, he'll be ready to greet you with his groovy orange suit and chest hair, as he lies on his heart shaped bed. The site is the latest addition to the Live Bingo Network and powered by the Cozy Games software. Barry is all set to romance you at the reels with his smooth, deep voice, shiny bingo balls and cheesy bingo moves! Barry's first move is to welcome you with an awesome welcome bonus, before showering you with promotions, offers and special treats. He'll then try to sweep you off your feet with his big bingo, slots, mobile and casino classics collection, and you can find more Big Love in his chat community! Barry clearly wants you to feel the love with him, so will greet you with a smooth 500% Welcome bonus! So if you spend £5, then you can pick up £25 extra to start playing with £30. The love doesn't stop there, as you can also pick up a 350% Bonus on your second deposit and a 300% bonus on your third deposit. Barry is ready and waiting with some special treats like daily specials, monthly £15K raffles, Session Bingo, £10K Slots Tournaments, Cashback, Money Multiplier and Big Love Jackpot Specials! 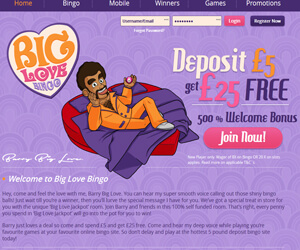 You can also play extra games and pick up exclusive treats in the Big Love chat room. Barry is ready to romance you further with his super smooth voice, while you play in his groovy collection of bingo rooms. You can cruise through a range of themed 30 Ball, 75 Ball, 80 Ball and 90 Ball bingo rooms, plus enjoy Free Bingo and Jackpot specials. You can then move onto the smooth slots lounge to play themed games like Fluffy Favourites, Cupid's Arrow, Easter Bunny, Britain Aire, Elizabeth the White Queen, progressive jackpot games and more. Next you can meet Barry in the casino lounge to play hot favourites like Keno, Deuces Wild, European Roulette, plus continue your romance with Big Love Chat community games and sizzling mobile games!